My day started quite funny really. I as kept awake a little by some very loud snorers that had been out partying but I can’t complain. I take that risk every time I book into a dorm. When I woke properly though, I found a very funny sire. One of the guys had fallen asleep on the kitchen table. He was face down, fully clothed with boots and all, with his legs, from his knees down, hanging off the end. The funniest part was that there was an empty bed right next to where he had crashed. I couldn’t help myself, I had to take photos. He seemed to stir at one point so I told him that there was a free bed (I knew he spoke English because I spoke to him the night before) and he kind of acknowledged me and then some words in Norwegian and then rolled over into a fetal position. Oh well, he must have been comfortable. I continued to get ready. Had a shower, ate, packed up and checked out. I put my luggage in the luggage room and headed out. It wasn’t bad weather. Cloudy but not the rain that I was expecting from a weather forecast I had seen. I was just planning on seeing as many building as I could in the hope some might be interesting. It helped that there was about 3 in a row that are mentioned on the map. When I got into the centre, there was even more red and white than the day before and they were all heading in one direction only. I was going with the flow for some of it and it turns out that they were all gathering for to march to the stadium together. I walked past the gathering and went walked up to a bunch of the buildings I was aiming for. 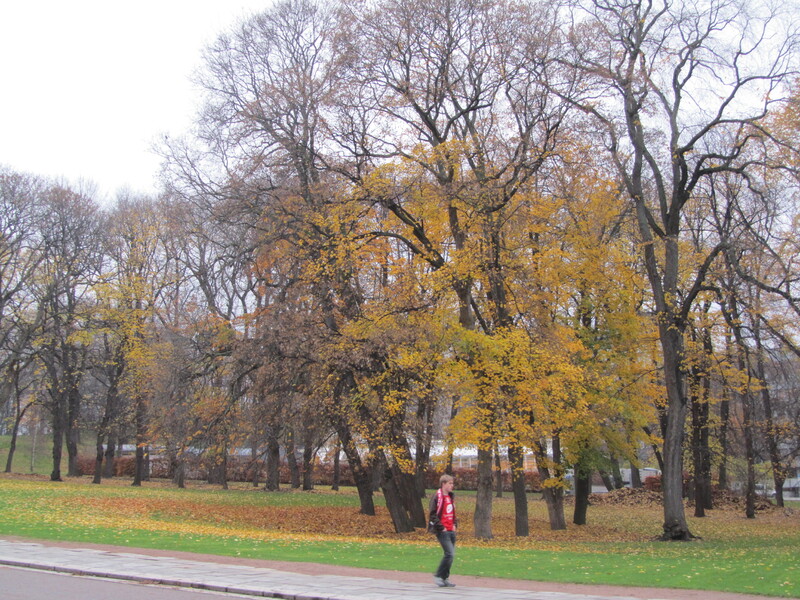 These included the National Theater and the old royal palace that a lot of open space around it and plenty of trees losing their leaves around as well. It actually all looked really cool. I then started heading for the harbour. 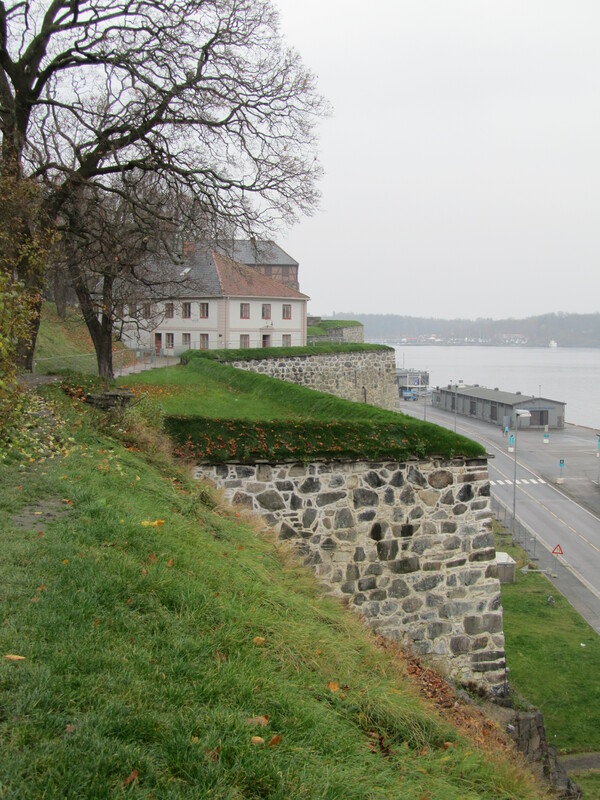 On the other side of the harbour was an old fort that I had a look in. I climbed up the walls and got a good view looking over the harbour. I also walked around some buildings that would have been military housing/admin in their day. When I had looked over everything, I started back to the centre so I could get some lunch. I found that Oslo had a lot of fast food. And not just kebab, Maccas and Burger King but lots of fast food chains that don’t exist outside of… well probably that one shop. I decided I would try one of these not real places. It was ok. At least the staff were friendly. Or maybe that’s just cos they are Norwegian. I am finding these people are super nice. Anything you ask, they will happily answer and even give you extra information. They also all speak English well. As in, better than any other country in Europe. Maybe even better than the Scots and Irish. 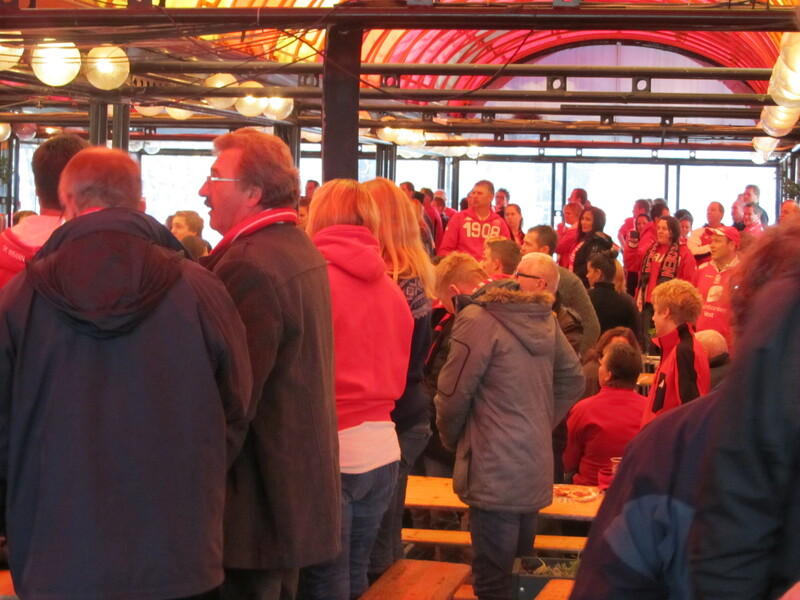 When I had finished my meal, I went back to where the crowd of Brann supporters gathering. 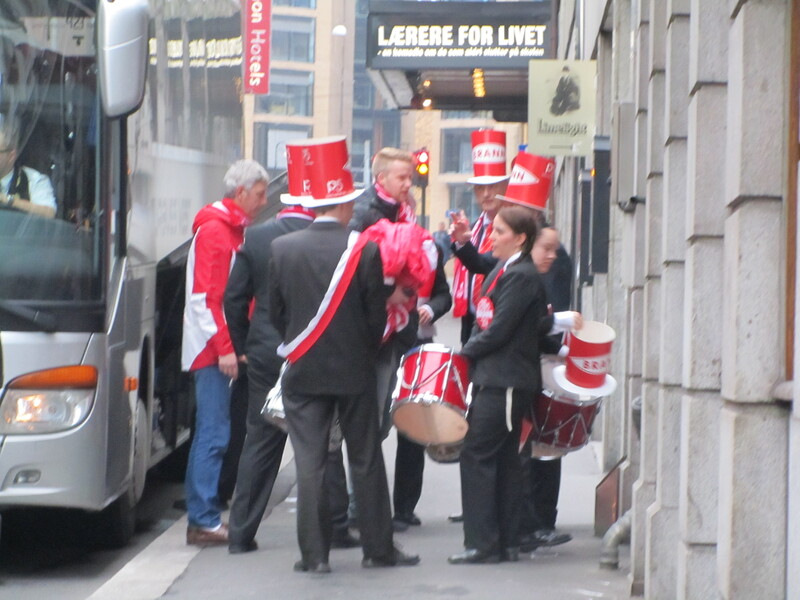 they had left but there was a bar that was full of only Brann supporters. I had already decided I would watch the game and this was the perfect place to do it. I thought I might need some kind of badge or proof that I supported Brann but I got in just fine with my red t-shirt. I found a seat with three random guys that spoke English (of course) and they were happy to chat a bit. We had some pre game entertainment brought to us by what I thought had to be a local Bergen man. When they played the anthem of Bergen, everyone stood and held their hand to their heart. After a while, the game started. What I found really strange was that when they played the national anthem at the start, I would say less than half of the people stood up. In a crowded place like that, most if not all of the Aussies would have got up. I just found it strange. In terms of the game, I was going for Brann mainly because there was more supporters and I was getting a lift with some of their supporters to their town of origin. Made sense to support them. The first half was entertaining. Brann was playing pretty bad. In fact the whole game was very sloppy with lots of free kicks being taken. Unfortunately it was the bad guys that scored first through what was actually an own goal. The ball was either going to miss or the keeper had it but it deflected off a defender and went the other way and in. It was pretty solemn in the room at that point. However, in the very next offensive move that Brann made, they got a corner which they scored off. This sent the crowd crazy. I think it felt even better because the other guys had just scored. People everywhere stood up and cheered and even when it had settled down a little bit, they had found their singing voices. The next goal was scored towards the end of the half by the enemy. It was a poor defensive effort but at the same time a good shot on goal as well. Again, sent the crowd very quiet. When half time came, no one got up to get more beer. This just didn’t seem… right in a way. In Aus, if it’s a break from play then the toilets, bars and food stalls are full. I pointed this out to one of the guys I was with and he just said that it was day number 3 of the party for most. I guess even Aussies would slow down a bit by day 3… The second half was better by our team but they were not good enough to score. Game finished at 2-1. Most of the people left the bar with hung heads and I followed. I had stuff to do. I firstly went back to the hostel. I had had a realisation during watching the game. I didn’t have any accommodation for that night and I would be arriving at about 1 in the morning. When I got back, I managed to get something that I could check into at stupid hours of the morning. I then headed out again and just wandered around to some places in a different direction to what I had been going during the day. I then went back to the hostel because that is where the guys giving me a lift said they would pick me up from at 5:00. When I got there, I found my Brazilian friends there. They were just about to leave for the airport back to Denmark. We sat around for half an hour or so before they buggered off. I waited until 5:45 until I heard from the guys. They had been held up but they were just 5 mins away. I picked up my stuff, went out the front and they were there. Quick 5 mins… Didn’t matter. I squeezed my luggage into the car and then myself into the back seat of the 2 door car. The car kind of struggled a bit with 4 guys and all their luggage but it survived. It took us a bit to get out of Oslo itself. None of them knew the way out (I guess that includes me as well) and we kept going in circles. I know for a fact we past the same building 3 times, perhaps 4… Didn’t matter, we got out in the end and we hit the highways. Basically this was like any road trip. We all got on pretty well. They all spoke excellent English and were happy to talk in it so that made it a little easier. We stopped for fuel and some food at one place. We stopped again (several times) for toilet breaks and then at 11:30, we stopped and had to wait for a ferry that was arriving at midnight. If we hadn’t caught that one, we would have to wait an extra hour and a half or take the looong route around. It was a very peaceful place we had stopped at least. Obviously, it was right next to the water and it was a clear (enough) night so the moonlight shone on the mountains opposite. Something I liked about these guys was they really did love their country. They never really said anything bad about it and, even though they had grown up in the mountains, they still appreciated their beauty. We crossed the lake…no sorry fjord and it was another 2 hours before we reached Bergen. I thanked them, paid my share of fuel ($20 which was a lot cheaper than train or bus and reasonable considering they pay $2.60 a litre which is stupid because they pull it out of the sea right there) and showed me the direction of where I was staying. When I reached the hostel, I had to use my credit card as a swipe card and it worked! What a great idea. I was able to use this to get all the way to my room as there was no one in reception. 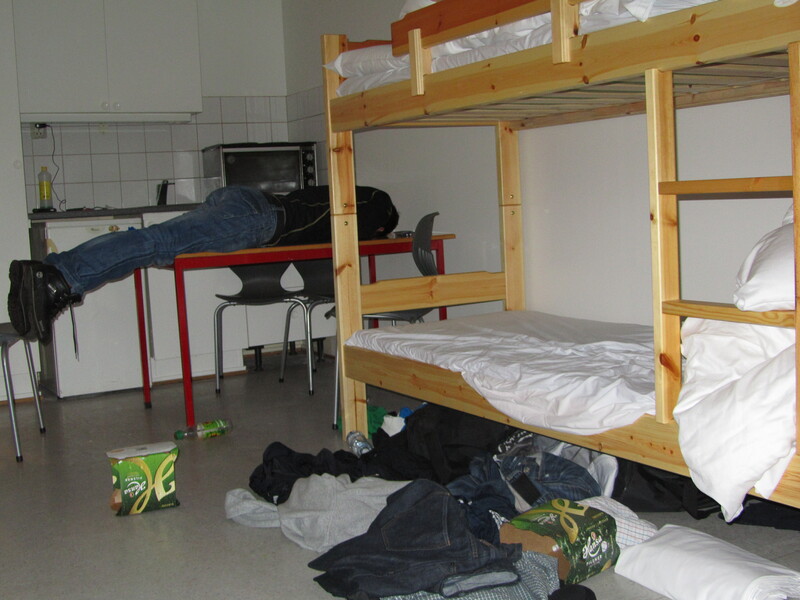 I was even given a 4 bed dorm to myself even though I had asked for the cheap, 10 bed. When I had got in, it was 2:30 in the morning. I was stuffed. I had had a huge day. Sounds like you are having a fun time. Makes good reading. Now I want to go to Norway! !